Lakeville Area Public Schools presents a one day workshop on how to use Socratic Seminars with your students. This workshop gives participants hands-on practice and skills to take back to the classroom. 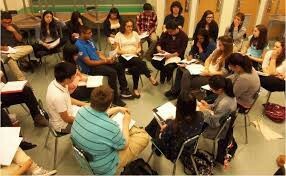 Socratic Seminars help students develop future-ready skills and a deep understanding of complex ideas. Learn to facilitate high-level student discussion through rigorous and thoughtful dialogue. The Power of a Socratic Seminar in the Classroom! Participants need to plan on a full day of participation. Some preparatory reading of student-based text will be required. Seating is limited. There will be a waiting list once we reach 30 participants. Registration and sub costs will be covered by Teaching & Learning.